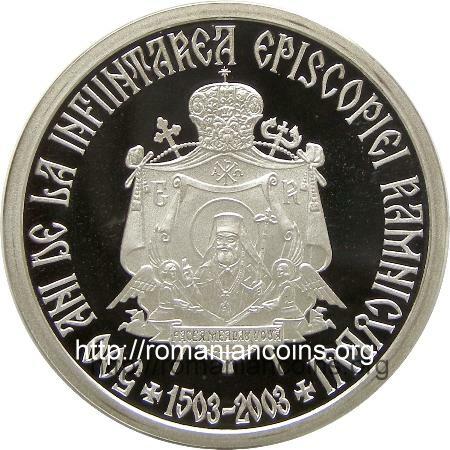 Obverse: ROMANIA, denomination value 500 LEI, Romanian coat of arms, year 2003 and, between ornaments, inscription "SFANTA EPISCOPIE A RAMNICULUI CTITORITA SUB RADU CEL MARE (1495-1508)" meaning "HOLY BISHOPRIC OF RÎMNIC FOUNDED UNDER RADU THE GREAT (1495-1508)" Reverse: Bishopric of Rîmnic coat of arms and circular inscription "500 ANI DE LA INFIINTAREA EPISCOPIEI RAMNICULUI +1503-2003+" meaning "500 YEARS SINCE THE FOUNDATION OF RÎMNIC BISHOPRIC +1503-2003+"
The Rîmnic Bishopric ahas in the middle the face of the holy hierarch Calinic of Cernica (monastery near Bucharest) and below inscription PACEA MEA DAU VOUĂ meaning MY PEACE I GIVE TO YOU. The holy hierarch Calinic was bishop of Rîmnic between 1850 and 1868, after being for 32 years abbot of the Cernica monastery. A great man of Culture, he was the founder of the bishop cathedral of Rîmnicu-Vîlcea (residence municipium of the Vîlcea county in Wallachia). He was sanctified in 1955. Nowadays the Bishopric of Rîmnic and Argeş pertains to the metropolitan of Oltenia, the seat of the bishop being in Rîmnicu-Vîlcea. The second row of the inscription is framed by the monogram of Jesus Christ placed over a fish shape and a metropolitan headdress. Monogram HR (XP in Greek capitals), the famous ensign made up of overimposed chi + rho letters, can be also observed on the coin reverse, namely on the bishopric's coat of arms, where lies between greek letters alpha and omega. Radu the Great - whose years of reign are written on the obverse - was thus surnamed by the princely chancellery writters for his tenderheartedness and not at all, as it could be naturally imagined, for his bravery in battles. In his foreign affairs the prince proved to be completely submissive to the Turks; moreover, in 1505 he handed to Baiazid II, subsequently to a simple request, the fords of Danube with their respective customs. The merits of Radu the Great are then to be sought for in the cultural and religious fields only. This Walachian prince brought from abroad the Serbian monk Macarie that printed (in the very year of prince's passing away) a liturgy book - the first printed material issued in Walachia. Radu the Great reorganized in 1503, with the help of Nifon, former ecumenical patriarch of Constantinople, the entire ecclesiastical hierarchy of the country. The seat of the metropolitan was moved from Curtea de Argeş to Tîrgovişte and, at the same time, the bishoprics of Rîmnic and Buzău were created. The voivod founded the church of the Dealul monastery (at the moment, the most beautiful in Walachia). 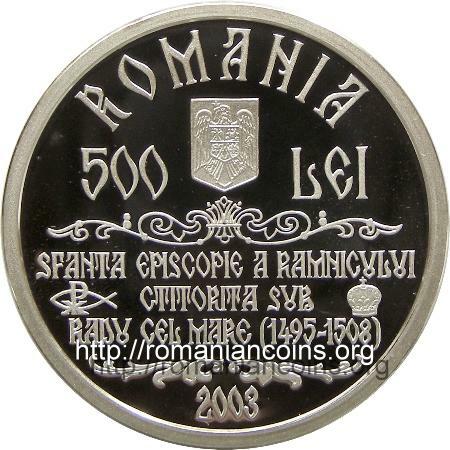 Apart from the FAO 100 lei in 1995, all Romanian silver and gold anniversary coins have two regions of roughness. The lower region is a shiny, mirroring one, whereas the higher, (corresponding to the details, letters, digits), has been polished in order to obtain a somewhat frosty gloss.